With housing inventory low across the country, many homes continue to sell at or above their listing price. After finally finding the perfect home following months of searching through a dwindling supply of inventory, home buyers will pay almost anything to secure “the one”! However, even though current inventory levels have caused homes to sell faster and at the highest possible price, sellers still need to be sure they are pricing their homes competitively. One of the biggest mistakes sellers can make is overpricing their home. In a real estate climate where inventory is rapidly moving, overpriced homes can still sit on the market for an extended period of time. Not to mention, an overpriced home encourages low-ball offers from buyer’s agents who recognize the fault. Over priced homes often result with “Price Reduced” homes, and the amount of interest amidst many potential buyers, especially those entering the market after the price reduction, will deplete. Desperate home buyers seeking their “dream home” are willing to pay top dollar. However, as inventory levels off, buying an overpriced home is problematic and results in losing money for new home owners when it’s ready to sell. The future of the real estate market is unpredictable, so while it may be tempting to compete with other bids, you very well may pay the consequences in the upcoming years. No matter what the real estate market entails, competitively priced homes sell faster and generate more traffic from potential homebuyers. In the current real estate climate, competitively priced homes are receiving multiple offers, many of which are above the listing price, as soon as they enter the MLS. To evaluate whether your home is priced competitively, or avoid buying one that is significantly overpriced, pay attention to the following. 1. What are comparable homes in the area selling for? It is crucial to look at comparable house prices when setting the price of a home because the value of a home is partially dependent on what similar homes in the area have sold for. Research to find out what neighboring homes are selling for and ensure that the home you are buying or selling is priced accordingly. If your home is a luxury estate in the middle of a modest neighborhood, it doesn’t mean your home is worth a significant amount more, as the area and neighborhood can actually bring the value of your home down. 2. How many days has the house been on the market? Today’s real estate climate has an abundance of homes selling within days or weeks after entering the market. When homes sit on the market for a high number of days, it is an indication that they are overpriced. On the other hand, competitive bids indicate that it is a reasonably priced home. If you are selling your home, monitor the number of inquiries and showings booked. If they are few and far between, it is a sign that your home has been over priced. Pay attention to the traffic flow and interest of other homes in the neighborhood for sale that are comparable to yours. Whether you are a buyer or a seller, listen to the advice of your Real Estate Agent. 3. Is the home priced for customized, unique amenities? While it might be appealing for you to have a tennis court, media room, expensive pool, wet bar, bowling alley and other luxuries as part of your property, these amenities lack luster to a broader audience. A home with these amenities should not be exorbitantly higher than similar sized homes that don’t have them unless you reside in a prestigious neighborhood with luxury estates, as homebuyers looking in these opulent communities desire similar amenities. Therefore, homes within an elite community that lack these features may actually end up sitting on the market longer while your home will still sell in impressive timing even with a price that reflects these accommodations. Again, ask your Real Estate Agent, as it is their goal to get you the best deal as efficiently as possible, whether you are buying or selling. 4. What is the current Real Estate Market? The economy has a lot to do with pricing a home. A house can’t be sold for as much in a slumping economy as it would sell for if the economy is booming. Is job creation relocating people to the area? What is the current housing inventory? Job creation, low unemployment and low inventory will result with higher priced homes. However, all homes throughout the area are subject to these price increases, so homes in similar locations with similar amenities should still be comparable in price. 5. What is the location? The house is located on a main street or only a couple of houses away from a busy street. Schools in the area are not highly rated. There are a lot of older residents in the area. Low Income areas generally include lower priced homes. Areas with a lot of diversity generally sell for less money because they are typically viewed negatively by homebuyers. Is the location associated with older homes that typically require extensive remodeling due to poor structure or home faults? What is the neighborhood or area amenities/recreation/entertainment? 6. Was the home updated or well kept? The house was built by a lower-end builder compared to similar homes. Fixtures, including the faucets, lights and shower, are not updated. The fence in the yard looks rotted. The cabinets have scuffs and scratches. Wall paper in certain rooms is outdated or peeling off the walls. Floors are poorly installed or cheap. There is clutter when showing the home. It lacks desirable traits found among today’s modern homes – granite counters, stainless steel appliances, landscaping, energy efficient appliances, etc. 7. Is the home price based on home improvements? There are several improvements that will not only boost a home’s selling time, but will also boost the price. These include updated kitchens, newly installed bathrooms, decks and other add-ons, and they attribute to a higher value. However, minor home improvements and repairs do not. While many sellers want to increase the price to offset the expense of these repairs, doing so can be detrimental in the long run, as many of these repairs are suggested to move the home off of the market faster, but do not warrant a higher price tag. It is vital to be aware of any improvements, add-ons, remodels, etc. that you (if you are the seller) or the seller (if you are the buyer) have paid for, and verify whether or not the improvements did actually add value to the home to ensure the price is an accurate reflection of the updates. In market conditions where inventory is scarce and there is a surplus of frantic buyers anxious to move, some overpriced homes are likely to sell. Generally, many homeowners are tempted to overprice their home because they think buyers will bid low, so overpricing ensures that they end up with a fair price in the end. 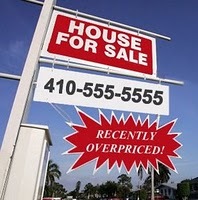 However, overpriced homes eliminate some buyers that would typically be promising candidates. The safest bet for anyone selling their home is to price the home at its most competitive price so that the property will generate interest from a broader range of buyers, prevent low-ball offers and move quickly. Talk to your Real Estate Agent if you have any concerns or reservations about the price of your home or a home you are considering.